For my year end trip to Australia, I used 150K US Airways Dividend Miles which I bought for $1702 (€1288). I managed to buy these miles at 1.1 dollar cents during their fabulous 100% bonus on shared miles promos back in Oct 2013, Dec 2013 and Apr 2014. I paid an additional $370 (€285) in taxes and fees to book Amsterdam (AMS) – London Heathrow (LHR) – Dubai (DXB) – Melbourne (MEL) – Sydney (SYD) roundtrip with the long haul flights in First Class and short haul segments in Business Class. My total airfare was €1573 for a trip which could have been easily €8280 booked as revenue ticket! After an uneventful British Airways Business Class flight from Amsterdam to London on Saturday afternoon, my Qantas Chauffeur drove me from Holiday Inn Express Heathrow T5 to Terminal 3 on Sunday morning. As Qantas First Class passenger, I had access to both the British Airways Galleries First Class lounge and the Emirates Business and First Class lounge. As expected, the service at the BA Galleries First Lounge was lacking. Nobody to welcome me at the First Class dining area, tables with stains and greasy spots, ages before someone took my order, etc… still a lot to improve British Airways! 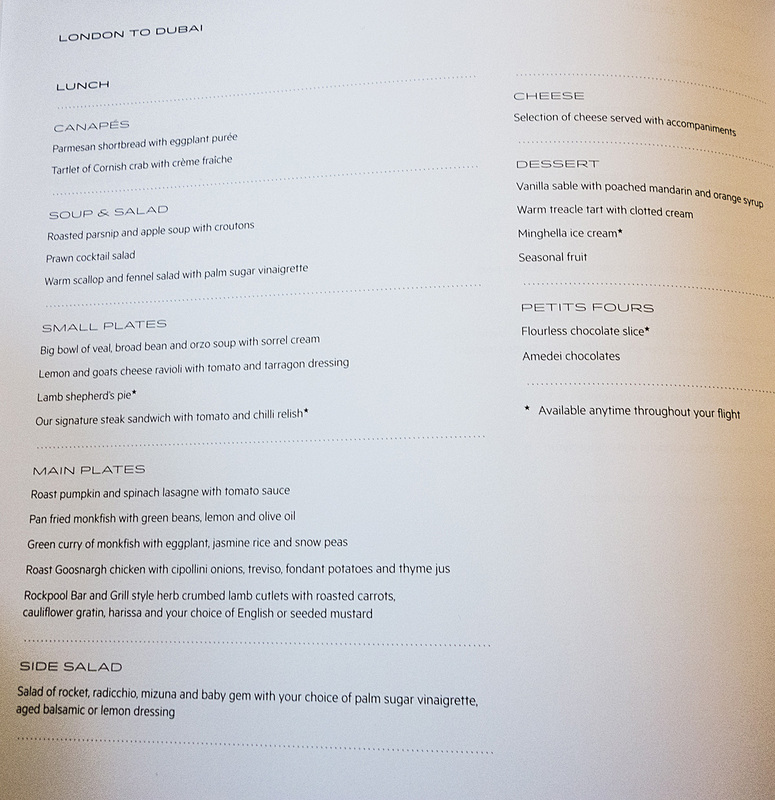 As a Qantas First Class passenger, I was entitled to a 15 minute Spa treatment (menu) at the No. 1 Traveller Lounge & Spa . Fortunately, my ‘Fix It Massage’ session was a bit longer than the advertised 15 minutes. The therapist was friendly and professional, the treatment room rather small, as is the case with most airport spas. For my second breakfast, I visited the Emirates Business and First Class lounge at London Heathrow Terminal 3. The lounge didn’t have a separate area for First Class passengers, which gave it a less exclusive feel. However, the food and beverages buffets were quite extensive. Around noon, it was time to board my flight QF10 from London to Melbourne (via Dubai). 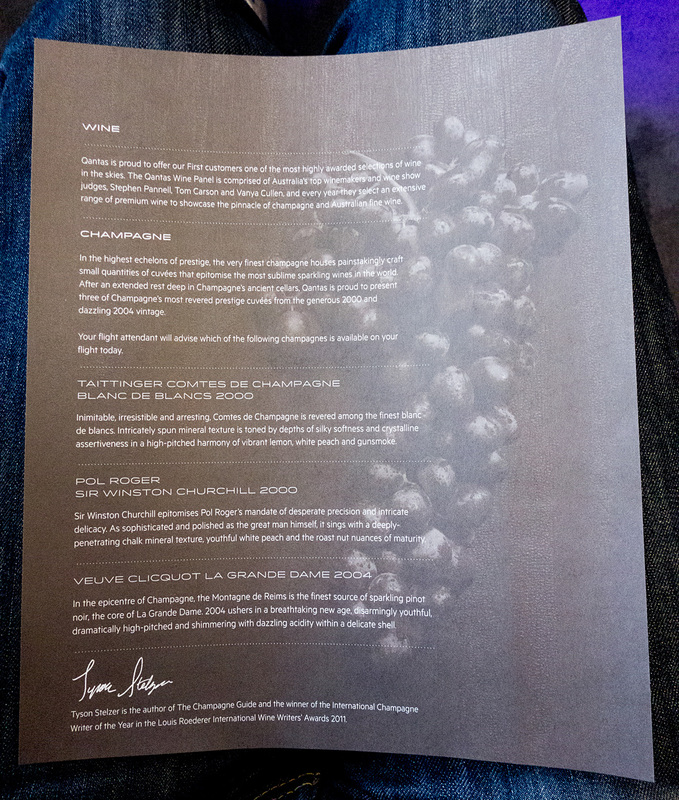 After reading a number of Qantas A380 First Class seating guides, I had selected seat 4A. The best seat in the house (3A) was already taken. 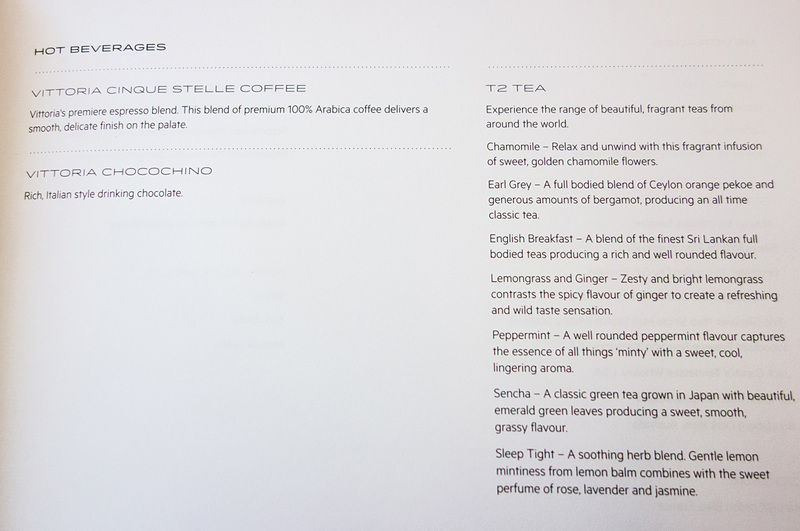 The Qantas A380 First Class cabin is rather crowded with 14 suites, e.g. Lufthansa has 8 seats in First Class, but you can make it a bit more exclusive by selecting a seat in row A. Why? As a passenger in row A, you share the aisle with only 4 other passengers as there’s a divider between row A and F.
First Class flight attendant Alex welcomed me on board with a glass of Taittinger Comtes de Champagne Blanc de Blancs 2000. The drinks menu read as follows: Champagne, wine, cold beverages and hot beverages. 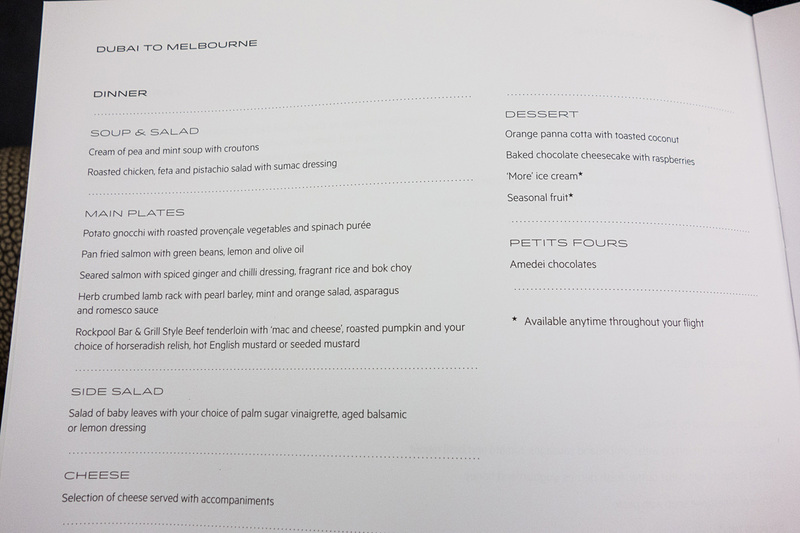 I didn’t have high expectations of the inflight catering, as Qantas doesn’t have a caviar service, something most other airlines offer in First Class. 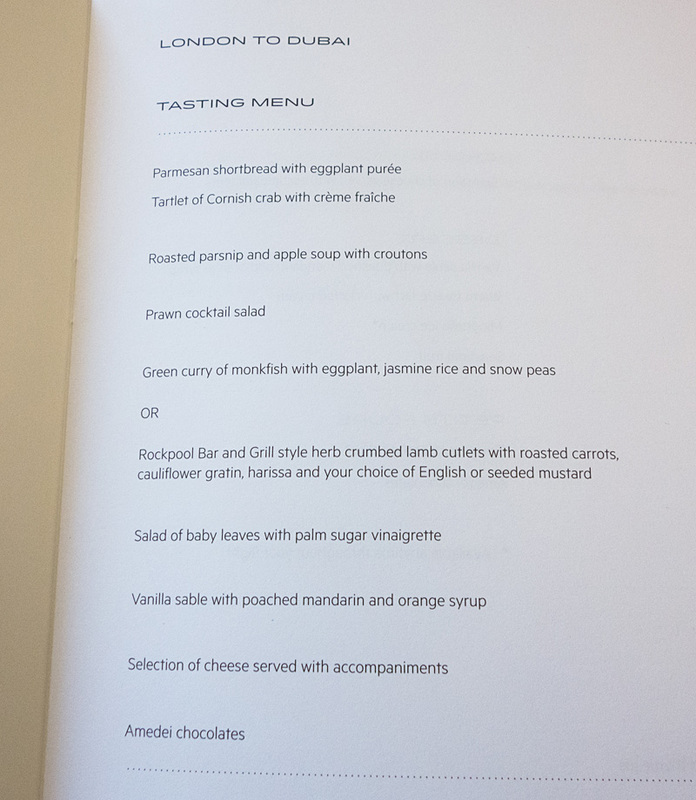 There were two menu’s for this 7 hour flight: a Tasting Menu and Lunch Menu. I went for the tasting menu of which the main course stood out: the Rockpool Bar and Grill style herb crumbed lamb cutlets with roasted carrots, cauliflower gratin, harissa and seeded mustard. It was one of the best lamb dishes I ever had… so delicious! Qantas flight QF10 made a short stop in Dubai (1:45min) on the way to Melbourne to refuel and give the passengers the opportunity to stretch their legs. As Qantas has a partnership with Emirates, First Class passengers can use the Emirates First Class facilities at the A380 terminal at Dubai airport. 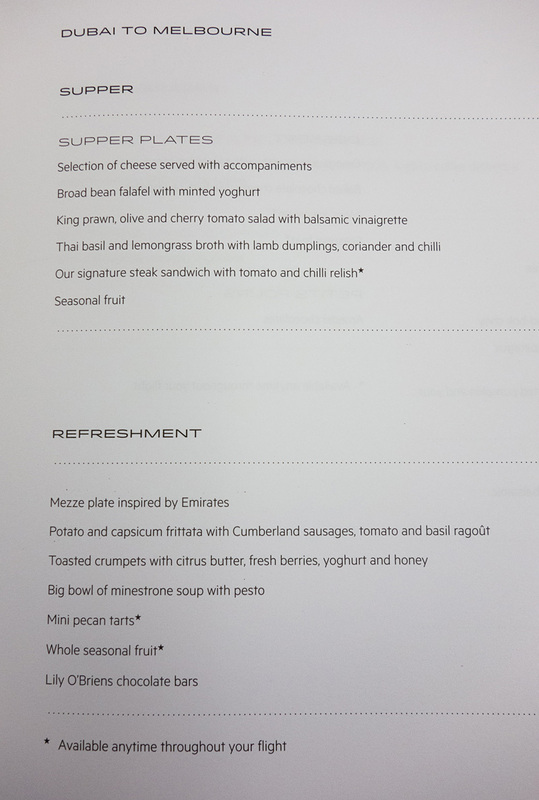 I used the opportunity to take a refreshing shower and had a quick bite at one of the Emirates First Class à la carte lounge restaurants. After our quick stop in Dubai, we continued the journey to Melbourne which was another 13 hours of flying. I returned to the same seat, but noticed only a few familiar faces. As expected, there was a new crew but also a number of new passengers in First. As it was well beyond midnight, I only had some light courses from the DXB to MEL menu: Supper and Refreshments, Dinner. 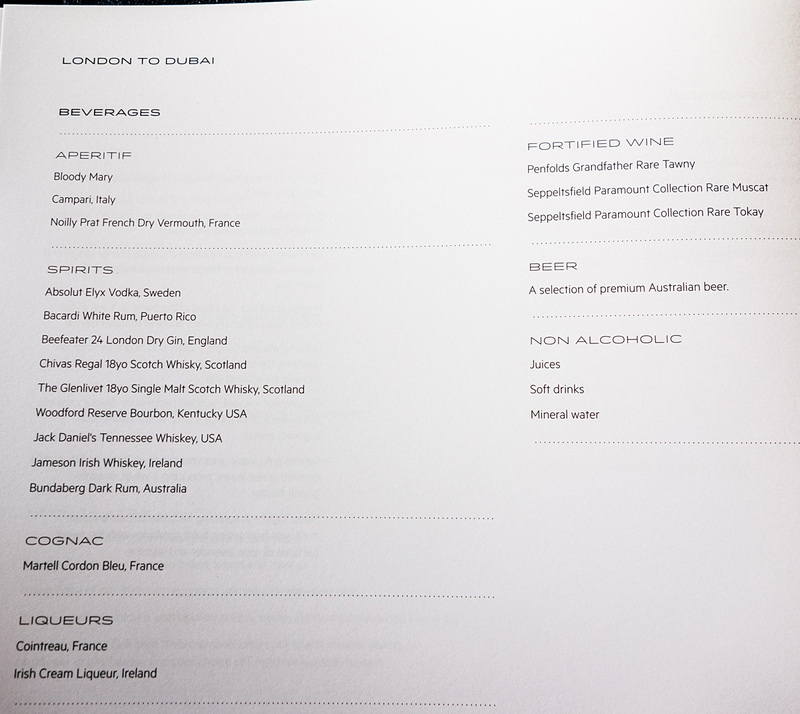 The Champagne, Wine and Beverages menus were the same as on the London to Dubai segment. After my light meal, I had the pleasure to enjoy the heavenly Qantas First Class bed. My new favorite in the sky together with the Lufthansa B747-400 First Class bed! A special thank you goes out to First Class flight attendants Alex (LHR-DXB), Matthew & Jamie (MEL-DXB) and Carine (DXB-LHR) for the fantastic service on my Qantas A380 First Class trip! Where did you find the 150K roundtrip tickets? That’s usually the price for BIZ tickets and not 1st. Thanks and good on you, man! Dear Bart, thanks for the great informative review. Thanks for your feedback Frank. The other pictures are made with the Sony Cyber-Shot DSC-RX100 I. We are taking a one-way from LHR to MLB in April next year using AAdvantage points (160,000 pts for both of us). How did you manage to get the chauffeur service? It states on the Qantas website that only Qantas ticketed passengers can get this service and our tickets are issued by American Airlines. Is there a trick to it you can let me in on. Thanks, I enjoyed reading your review and am really looking forward to this flight as it will be our first in first!! 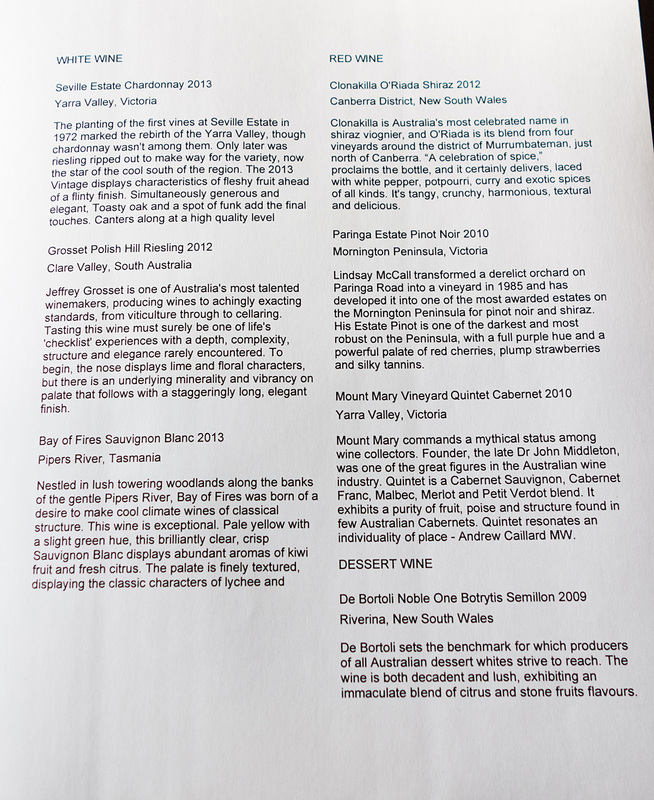 Hi Ross, I read similar statements on Flyertalk about the chauffeur service but was able to book it via the Qantas site. Did you already check your booking at the QF site? It should appear as an option under manage your booking. Might have changed if not. Hey Bart! Great review! 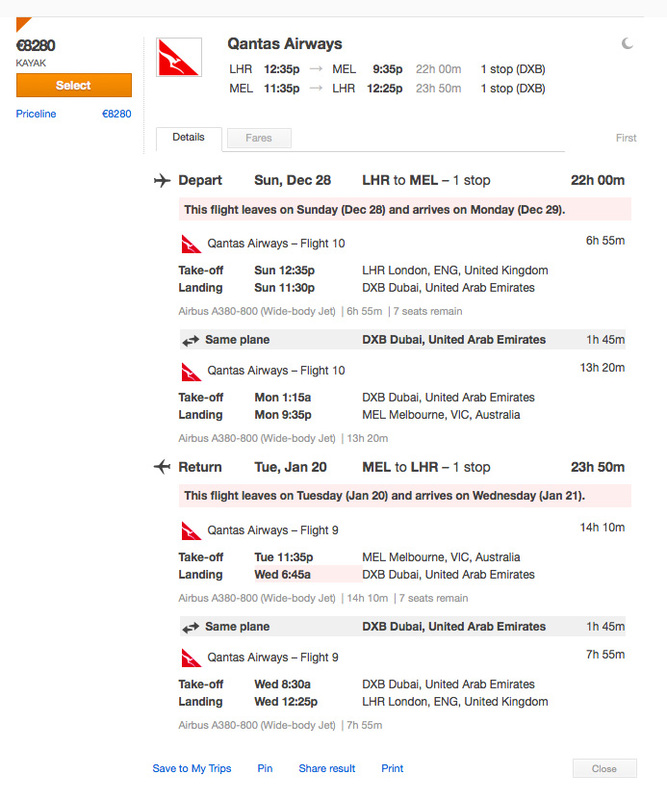 Just booked my fiancee and I on the LHR>DXB flight in first class but Im torn on which seats….I wanted the A row but 2A and 3A are taken…Im contemplating either 3K and 4K or 4A and 5A (even though this is a bassinet seat) We like our own space and know we can dine together as well but with only a 7hr flight we don’t mind…Any suggestions? Hi Levi, 3K and 4K will be fine. No worries. Enjoy your trip! Feel free to check out my Qantas A380 first class review. Cheers, Manny.